Sometimes being a parent who wants to share a love of reading with your child is not easy. I will defend to the death my child's right to choose books for himself, but oh, reading Thomas the Tank Engine during our daily read-aloud became wearisome. One hundred and fifty three times! That's why I love to find books that work on two levels: they entertain the adult reader AND the child listener. It's a Book made me giggle and I bet it will you and your kidlets too. 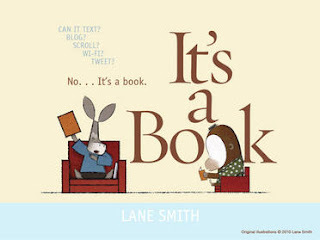 Written and illustrated by Lane Smith (Walker Books 2010) this children's picture book is deceptively simple, but there's lots going on. Some of us are fascinated by electronic devices. Jackass is used to gadgets that scroll, text, tweet and need passwords. Monkey keeps explaining that what he has, is a book, just a book. Finally Jackass takes a look and becomes absorbed in the book. Will Jackass work out that a book is just a book? Will Monkey become exasperated with his friend? And what does Mouse have to do with it? My favourite page is the last one, where Mouse pops out from under Monkey's hat and chortles, "It's a book, Jackass." This made me laugh out loud, a satisfying joke yet not a put-down, that I didn't even see coming. The illustrations are large, simple and clear, making the book perfect for the toddler set, but the story and the humour will resonate with kids from 2 - 82! So yes, I have a new favourite picture book! I love It's a Book. It has edged its way into my life and is now my favourite exasperating answer to questions: "What's that bird sitting on the clothesline?" "It's a book!" Check out the trailer if you need to know more, then race out and find it. Find what? It's a Book! Find more children's book reviews at The Book Chook. I guarantee a giggle, Kelly! Tif! Me too. If you have time, check out The Robot Book trailer in my Merry Christmas post. I must have missed that one! Going to check it out now!! Lyn, thanks for explaining. I had heard there was a problem with the word "jackass" and couldn't work out why. I've never heard of the Jackass movie franchise. Perhaps just as well?